The 67th World Congress of the International Press Institute (IPI), a global network of editors, media executives and leading journalists, will be inaugurated by Nigerian President Muhammadu Buhari in Abuja, Nigeria on Thursday, June 21. Under the theme “Why Good Journalism Matters”, the Congress will affirm the indispensable role of quality media in building strong societies, showcasing investigative stories and projects that bring positive change to individuals and communities in Africa and around the world. The event marks the first time IPI has held its flagship global Congress in West Africa since the organization’s founding in 1950. 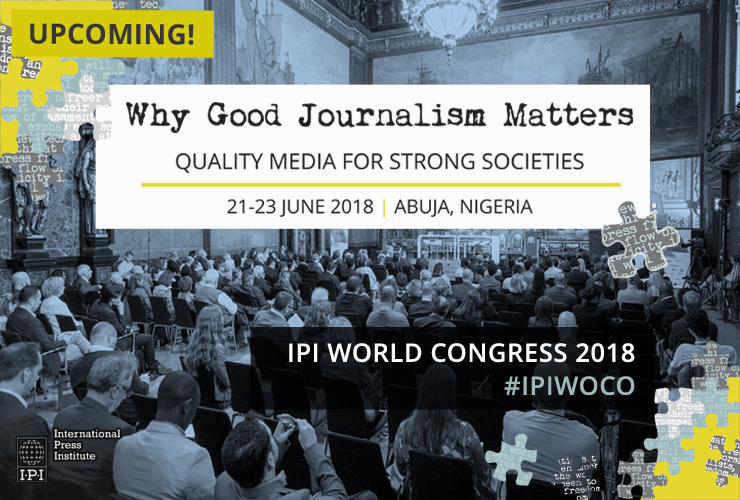 More than 250 top media professionals from dozens of countries around the world will gather in Abuja for a series of panel discussions, debates and workshops centred on the fight to protect public-interest journalism and ensure that it is strong enough to face contemporary challenges, while remaining faithful to core values. Key topics to be discussed include journalist safety, “fake news” and state surveillance. President Buhari will officially open the Congress on June 21 at a special ceremony at the president’s villa. 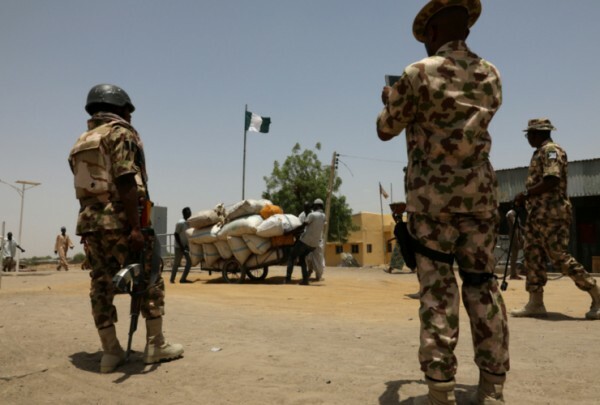 Nigerian Vice President Yemi Osinbajo; Minister of Information and Culture Lai Mohammed; and Senate President Bukola Saraki are among the high-level Nigerian government representatives who will attend the Congress and address Nigeria’s progress toward providing a safer environment for journalists. Nobel-Prize-winning poet and playwright Wole Soyinka, known for his defence of human rights and democracy in his native Nigeria, will address the World Congress gathering as part of a gala dinner on June 22 honouring this year’s IPI World Press Freedom Hero, Angolan anti-corruption journalist Rafael Marques de Morais, and Free Media Pioneer, the pathbreaking Philippine news website Rappler. Marques is currently on trial in Angola for reporting on real-estate transactions involving the country’s former attorney general. He faces up to four years in prison if convicted. In the Congress’s town-hall-style opening panel, key media industry and thought leaders – Associated Press Vice President John Daniszewski, Rappler Managing Editor Glenda Gloria, BBC Director of Editorial Policy David Jordan, Mail & Guardian (South Africa) Editor-in-Chief Khadija Patel, and Al Jazeera Acting Director General Mostefa Souag – will share their visions for the future of quality journalism and address the hurdles of connecting with audiences in a rapidly evolving information ecosystem. While maintaining its global outlook, the Congress will offer a particular and unique look at the state of press freedom and independent journalism in Africa through the half-day Africa Media Forum on June 22. The Forum will start with a critical examination of political transitions on the continent and their significance for freedom of expression. Leading African journalists, editors, academics and tech company representatives, including Google’s Nigeria country director, will debate, among other topics, the future of digital journalism in Africa, state censorship, the impact of terrorism on the news media and labour conditions. The Congress will also honour journalists who have lost their lives as a result of their reporting over the past year, including Kashmir’s Syed Shujaat Bukhari, Slovakia’s Ján Kuciak and Malta’s Daphne Caruana Galizia. Caruana Galizia’s son Matthew will join the Congress’s special “The Story Lives On” panel, which will highlight ways to keep journalists’ work alive after they are murdered, among them the pathbreaking Daphne Project. Nigeria, Africa’s most populous country, is home to one of the continent’s fastest-growing and most exciting media landscapes. Over two dozen leading Nigerian media outlets, including the Daily Trust, This Day, and Channels Television, are official partners of the Congress, ensuring strong support and participation from the local journalist community and allowing for an exchange of skills and experience between Nigerian journalists and editors and their international colleagues. The Congress will also feature two pre-event workshops: a workshop on online safety, presented by Facebook; and a workshop on covering elections, held in partnership with the Nigerian Independent National Electoral Commission (INEC), Copenhagen-based International Media Support (IMS) and the UNESCO regional office in Abuja. IPI’s General Assembly, to be held on Saturday, June 23, will see the election of new members of IPI’s global Executive Board as well as the publication of IPI member resolutions in response to press freedom developments globally. Founded in 1950, the International Press Institute (IPI) is a global network of editors, media executives and leading journalists dedicated to furthering and safeguarding press freedom, promoting the free flow of news and information, and improving the practices of journalism. Based in Vienna, IPI has members in more than 100 countries.